This is a date of great interest to yours truly, but it is obviously a time that will mark the rise of a sleeping giant. Okay, I exaggerate, but this is the date I was invited along to visit the band by it's ex Chairman, John Carlo Bellotti. For some time now, this group of enthusiasts have centred the "band" in the village hall in Blackford, Perthshire, situated almost centrally in Scotland on the A9. In November 2012, the committee of the band took what could be an enormous step in the future of the band. 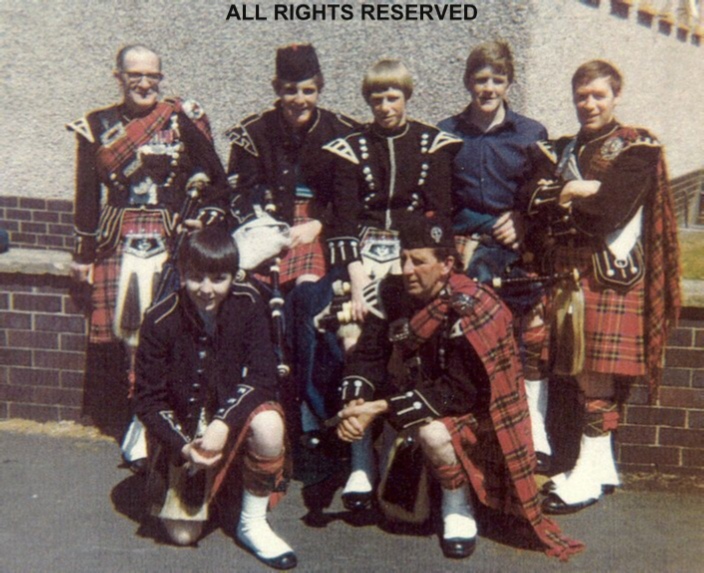 When you keep in mind that these folks have kept the band alive by actively starting a teaching programme of local youngsters in Bagpiping and Drumming. By invitation, in November 2012, the band brought in an experienced Pipe Major in an effort to bring all these things together and forge it into an active unit, a Pipe Band. February, 2013, and I arrive to pay a visit. It was most encouraging the see that on a Monday night, in the main hall, twelve actual Pipers of varying standards all sitting around the table working of tunes. Two other young learners, who were possibly only available on a Monday, were receiving chanter tuition at the other end of the hall. A visit to the kitchen and here I find a group of youngsters all working on drum pads in an early effort to put together a drum corps. A healthy sign for me was that all the work is being related from written drum scores, and led by a true enthusiast. Okay, we have people working on instruments. Most importantly though, is the supporters who are all there working to make it all come together. These are the people, who may be retired playing members, who give encouragement at practice, who help with tuition and of course make the TEA! Having dealt with Monday, I have to add that there is a good "engine room" in the band when it all comes together on a Thursday evening, dedicated to the novice learners in all departments. Without this, they would be wasting their time in the Long run. All the best the John Carlo Bellotti in his new life in Melbourne. Strathearn are on the move again! After a while of "being in the doldrums" there are now signs that this once great band from the Crieff area are about to take a long hard look at themselves and try to rebuild. This outfit, who previously won Grade Three World Championships and even made it to Champions of Champions, are now based in Blackford, Perthshire. Although they are not presently registered with the R.S.P.B.A., this is about to change and they are actively working on teaching local juveniles as a feeder to their own ranks. From my own experience of the pipe band world, I would imagine that they could do with help and new ideas from all quarters. If you are a Piper, Drummer, Tutor or Enthusiast and feel you have something to offer, I would suggest you contact me (pipingteacher@hotmail.com) and I will see that word reaches them. 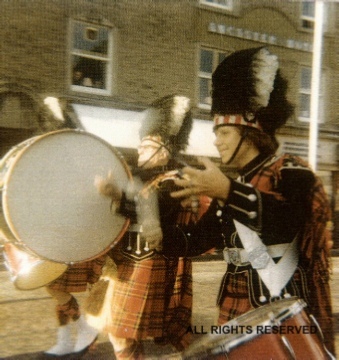 Twelve years after the British Legion Pipe Band in Crieff folded, the idea of re-forming a band in Crieff was discussed by two local farmers, Donald Mclean of Dornock Farm and Archie Osborne of Culcrieff farm who met on the Jack Olding stand at Perth Agricultural Show in August 1967. A public meeting was held in November 1967 and sufficient interest was shown by the 20 people who attended that a band was formed and a committee elected. Jack Scott Millar was elected President, a position he would hold for the next 30 years, and Donald McLean, who went out to move his car, returned to the meeting found he had been appointed secretary. 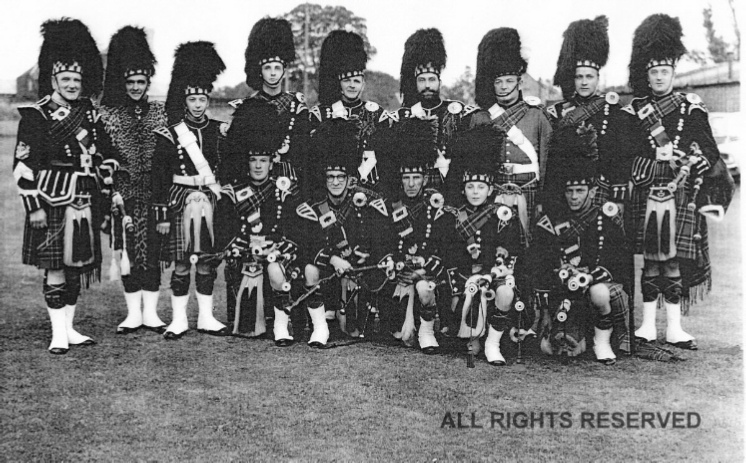 A number of pipers and drummers joined and Archie Osborne, who had been a P/M in the RAF was appointed P/M and George Newlands was appointed L/D. In their first year the band raised over £1000 which was spent on uniforms. New kilts of Drummond Earl of Perth tartan were bought along with a number of used tunics and belts from Forfar Burgh band and sporrans from Edinburgh City Police Pipe Band. 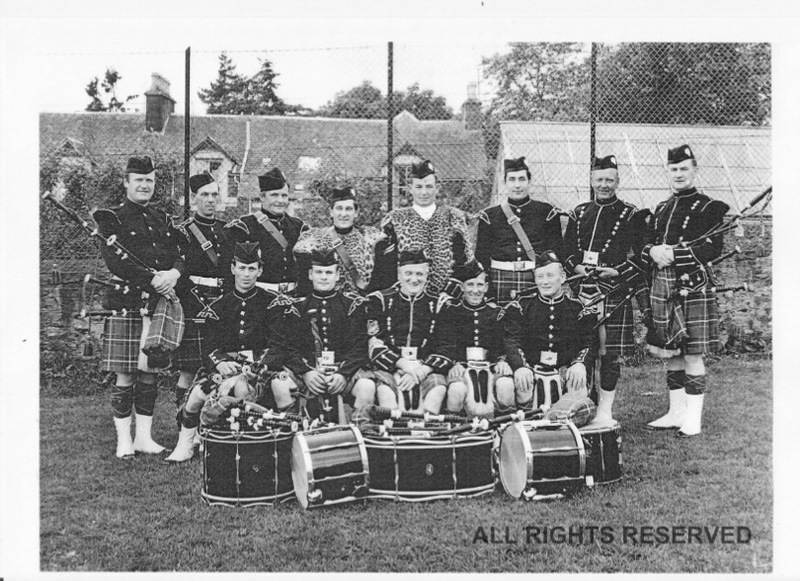 I stumbled across the site by chance and found a photograph of my Father , he is in the photograph back row far right of The Strathearn pipe band, named as Doug McLellan I can confirm that his name is Tom McLellan . He spoke often of the band and joined it having recently returned from Canada where he had spent some 10 yrs. Unfortunately my Father passed away last November 6th 2011. His sister Helen McDonald of Newbigging farm is the recently retired town councillor of Crieff. Same location, same event, but 1976 wearing black jackets. Archie Osbourn retired as P/M in 1976 due to ill health, and his new thriving business, "Strathearn Reed". 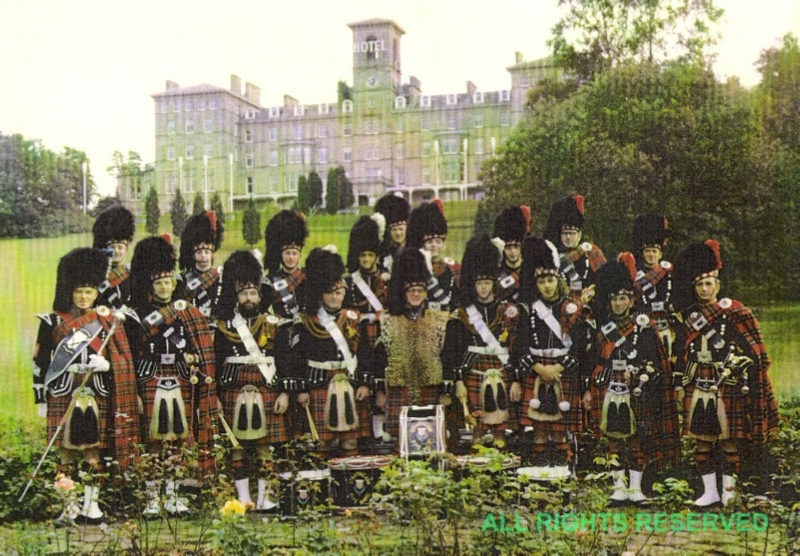 At this time the band decided not to be a competition band and carried out numerous engagements, many at Dunblane Hydro Hotel. The band had a close relationship with Jim McLeod and his dance band, and appeared with them, the hotels resident band, on radio and television. Each year the band would provide entertainment in the hotel ballroom for one week, seven nights, performing in full dress under the spotlights. By the end of the week the tunics were so damp due to sweat that they would not dry out properly, and the band paid for all tunics to be dry cleaned. 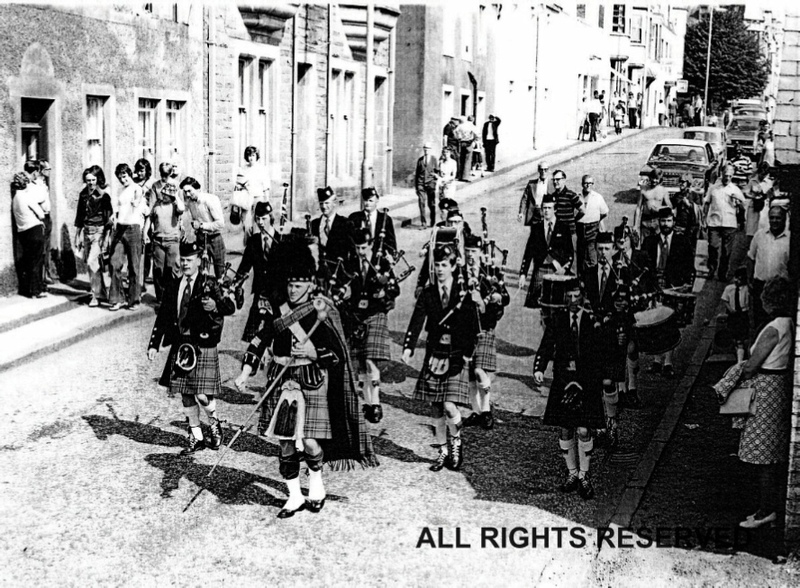 In 1979 the band were invited to participate in the Isle of Man Millennium celebrations which involved the band touring the I.O.M. for a week playing twice daily at different towns and villages. Rear: Billy McCraw, Hamish Lowe, Alistair Lowe, Fraser Smith, John Millar, Wilson Brown, Lawrence McLennan, John Liddle, Niel Bremner. 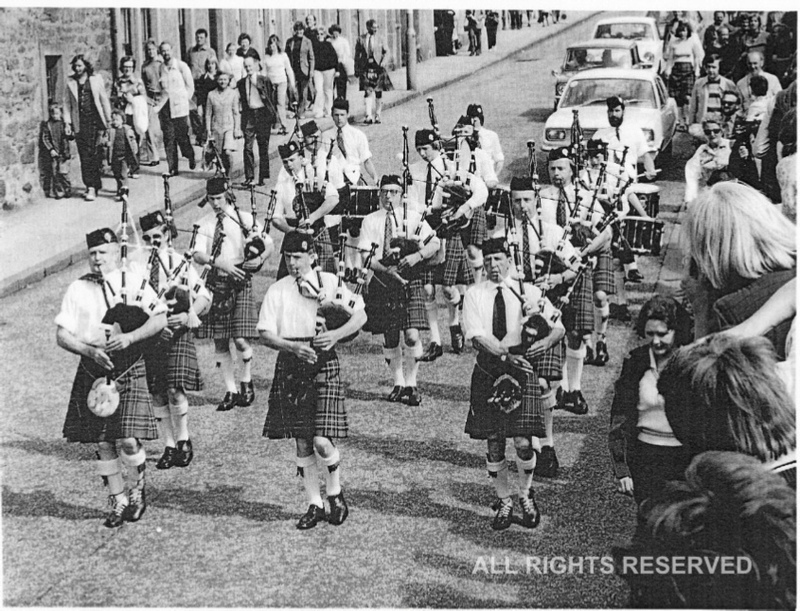 Sees the band on Edinburgh Castle Esplanade playing with the Royal British Legion Pipes during "Beating Retreat"
In 1981 P/M Kenny Leask replaced P/M Jimmy Mortimer and prepared the band for competitions. At this time some of the older members of the band left the band joining the recently revived Comrie band. 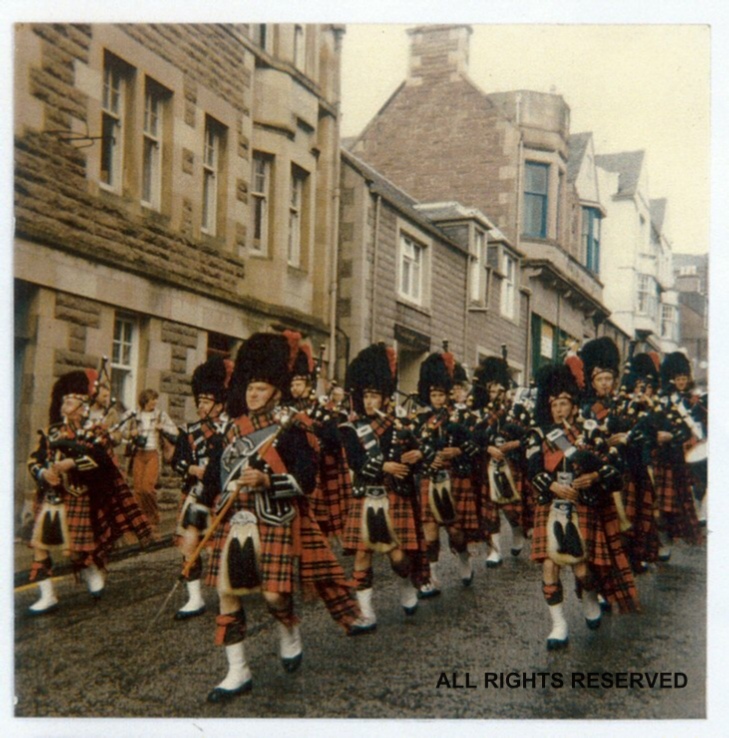 New members were brought in and Jimmy Mills, the L/D with MacKenzie Caledonian did an excellent job in tutoring a new drum corp. By 1984 the band had great success in the local grade 4 competitions, always having to fight it out with the Kirriemuir Jubilee band for the honours. 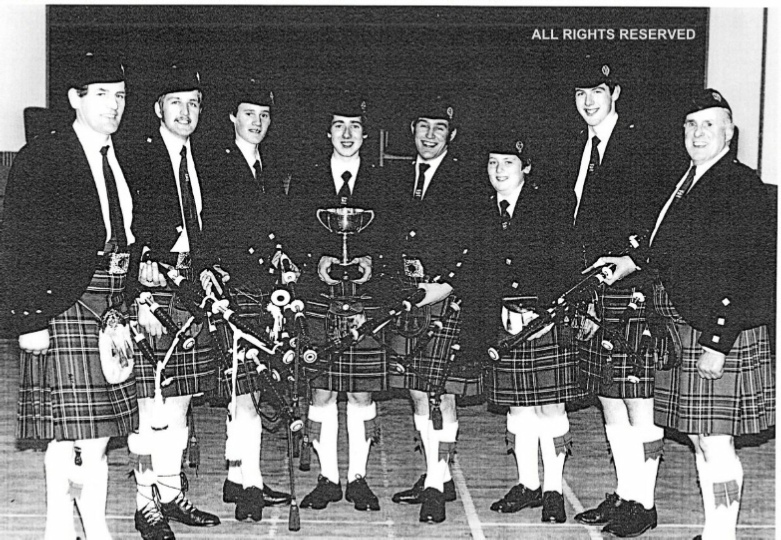 honours were not far away with a 4th place at the British and a 6th place at the Scottish secured that year, before Kenny Leask had to give up the position due to work commitments.